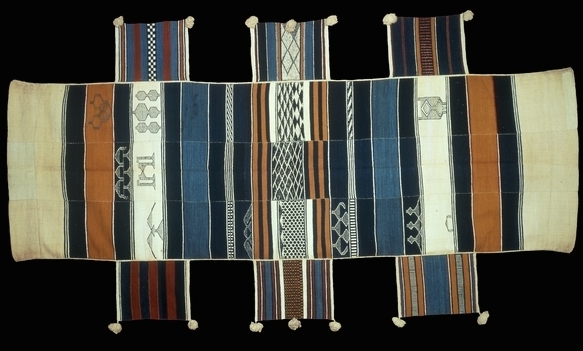 This is an elaborate hammock probably made for a male or female chief in Sierra Leone in the early twentieth century. Prior to the advent of motorised vehicles and an extended road network after the Second World War men and women of status in Sierra Leone used elaborate hammocks as a key means of transport in inland areas. During the colonial period British officials would also commission hammocks for their personal use. These hammocks had a heavy wooden frame with a cloth canopy to protect them from the sun and the hammock was supported on the heads of four bearers. The slung part of the hammock was made from between three to five strips of woven cotton sewn together edge to edge to form a wide cloth. The ends were doubled over to form a loop through which the carrying poles were inserted. The cloth used for the slung part of the hammocks was inspired by the kpokpo(“country cloth”) tradition. Such cloth was woven in varying width narrow strips by men using a double-heddle loom. Kpokpo cloths use predominantly locally grown cotton often combined with imported machine spun yarn to provide greater strength and a wider range of colours. These specialist weavers demonstrated their creative ingenuity and technical knowledge in the design and patterning of some of these cloths which displayed the prestige and wealth of their owners. This hammock is woven in three weft-faced strips in various shades of indigo, brown, red, and natural colours. Supplementary weft float motifs in black and white cotton thread are scattered – seemingly randomly – along the weft bands. The centre of each band has a block of densely-worked tapestry weave geometric motifs. Along each side of the hammock are three separately woven flaps with bold weft stripes and natural-coloured pompoms. These would have been highly visible as the hammock travelled along and may have been specially designed for such public display. Cite this page as: The British Museum, "Cotton hammock (Vai peoples)," in Smarthistory, September 24, 2016, accessed April 19, 2019, https://smarthistory.org/cotton-hammock-vai-people/.